Ole Gunnar Solskjaer spoke to BT Sports after Manchester United’s 2-1 win over West Ham in the Premier League. “We got away with it,” Solskjaer said first. He accepted that the performance wasn’t up to scratch and said the changes from midweek took their toll. The Norwegian referenced previous games when United played well but came away with nothing, so he will obviously be delighted with the result. United knew a win was needed tonight after losing 4 of their 5 games prior to this one. Our top four hopes are still alive but that could change quickly with the number of strong teams challenging for the Champions League spots. At this stage of the season, you’ll settle for questionable performances as long as your team is winning. 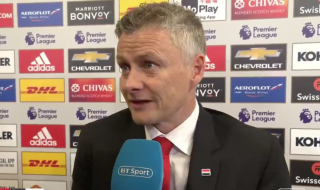 Watch Solskjaer’s post-match interview with BT Sport below.